A real new entry of Calabrian cuisine is the exotic “Limone Caviale” (Caviar Lemon), cultivated in our land, become a trendy food from the stellar price. Calabria is not new to the presence of exotic fruits, ended up becoming identifying products thanks to a long history and the unattainable quality guaranteed to them by the land and by its particular microclimates. Plants such as Cedar, Bergamot, Calabrian lime, some typical varieties of oranges and mandarins, the Annona Cherimola, are now part of the Calabrian agricultural landscape, as for centuries, even if their ancient exotic origin has been forgot. Over time, the arrival of new species has not ceased, such as the recent planting of “Goji” in the Piana di Sibari, where the famous “health berries” have seen their nutritional quality improve to the point of becoming the best in the world. 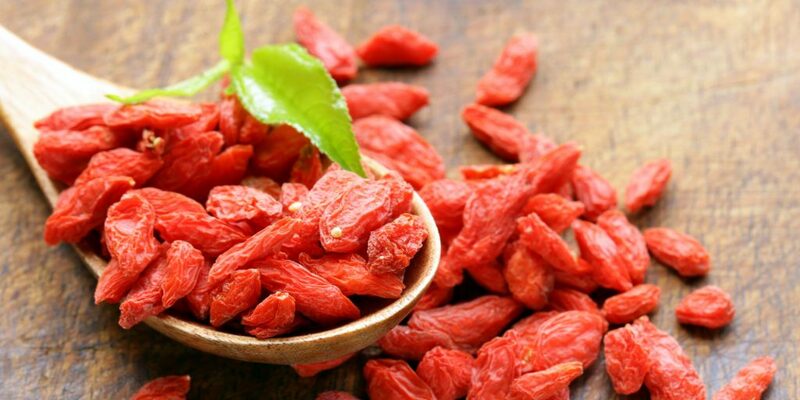 “Goji” is the well known (Lycium barbarum, or Ningxia goji) chinese berry, native to Asia, which has been long used in traditional Asian cuisine. The fruits has recently become common in the West as health foods or alternative medicine remedies. And in this same area, already known for the excellent quality of its citrus fruit, has recently made its debut “Limone Caviale” (Caviar Lemon), a new variety of citrus, surprising for its characteristics and price. The price is simply stellar! 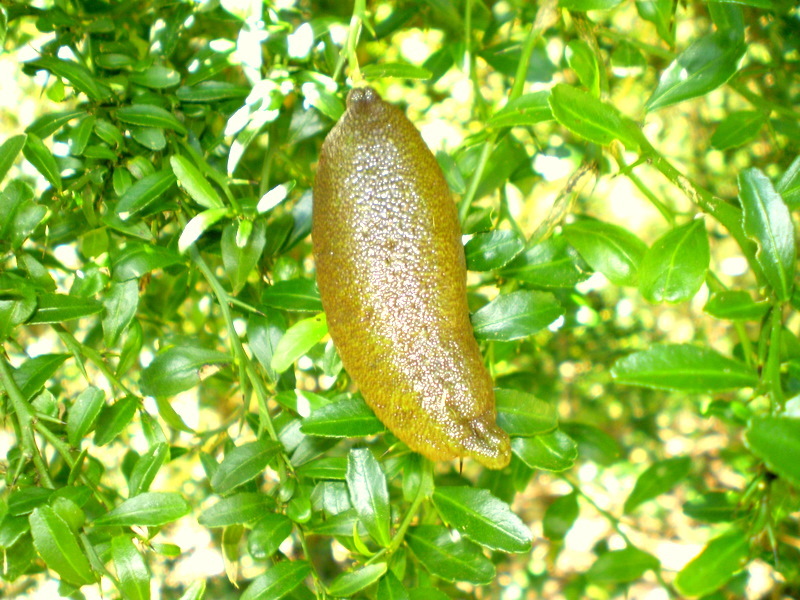 This is also called the Finger Lime (Microcitrus australasica, Limone Caviale or Caviar Lemon), literally a “Finger Lemon” because of the almost cylindrical shape of the fruit, more commonly called “Caviar Lemon” or “Citrus Caviar”, name suggested by the pulp composed of a myriad of spheroidal vesicles of juice, which are broken by chewing and that resemble the caviar in an incredible way. White, red, pink, green, with an intense or more nuanced color, the small soft spheres of the Finger lime are intriguing with their intense spicy aroma to the creative minds of the chefs, ready to use them in the most imaginative dishes, where taste and aesthetic impact go hand in hand. In short, it is the raw material for starred cuisine or luxury vegan, as also reveals the price per kilo, which revolves around 200 euros and makes it a fruit to be measured carefully, as if it were real Russian caviar. Calabria, given the already consolidated citrus vocation of the Piana di Sibari, is an excellent candidate to achieve the best results in this new cuisine culture. 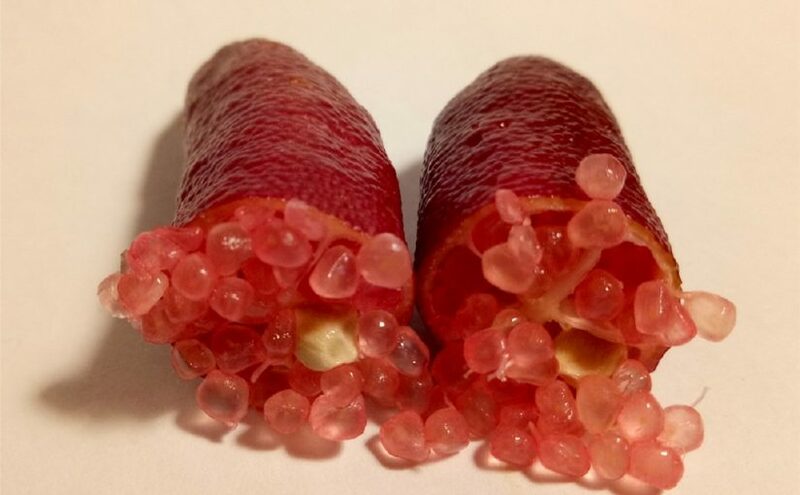 This decidedly bizarre fruit, Finger Lime, comes from a small and thorny shrub from the eastern subtropical coastal area of ​​Australia, to be exact from the areas of Queensland and New South Wales, two lands characterized by an almost Mediterranean climate. The fruits, with a characteristic oblong shape of 5-10 cm, sometimes slightly curved, have a smooth or slightly wrinkled skin with colors that, even in the pulp, go from green to brown, to reddish, to blue. It is not strange saying that this citrus is that with the widest color variation, among all other species present in Calabria. The plant is continuously re-flowering, which guarantees a continuous fructification throughout the year. As for the taste of the pulp, it is described as a mix between bergamot, grapefruit and lime, with notes of pink pepper, while the peel, usable grated in the kitchen and in pastry, gives a pleasant bitter note. 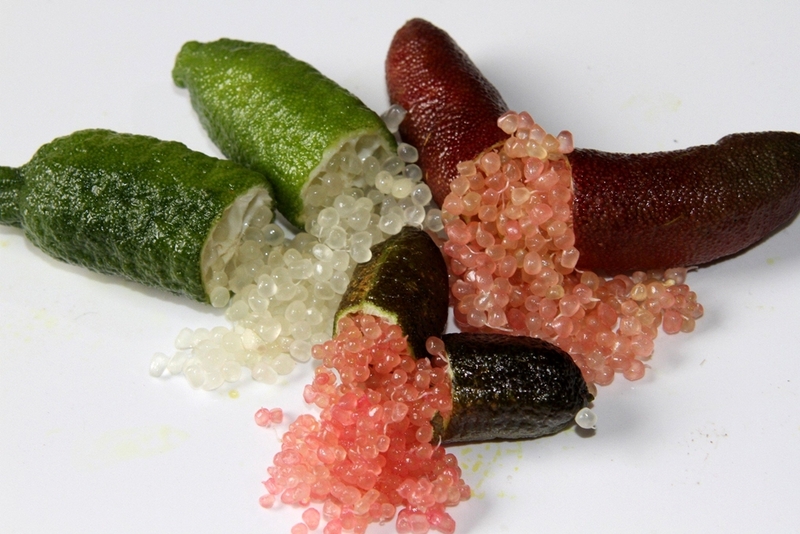 More than for natural consumption, Finger lime is in fact particularly suitable for gastronomic preparations, to which it confers taste and beauty without renouncing significant nutritional values: in fact it boasts antiseptic properties, promotes digestion, is refreshing, diuretic and provides good quantities of vitamin C, B6, folic acid and potassium. In short, “Limone Caviale” is a a fruit of great versatility, capable of seducing even the most demanding gourmets. Calabria is a terrain somehow ideal as location for breeding. This unique territory allows to pigs, lambs and goats to roam around. Therefore, the sun and hardy soil make for an ideal environment to grow an abundance of animals and also vegetables like tomatoes, eggplants, zucchini, mushrooms, sweet fruits and olive. Calabrian olive oil is used also to preserve all afore mentioned products. Cured pork products give raise to a wide selection of salami, from soppresata Calabrese to capicolla. 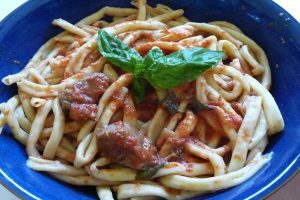 They accompany Pasta, which is eaten daily in Calabria; the homemade version is generally made only with semolina flour and water. 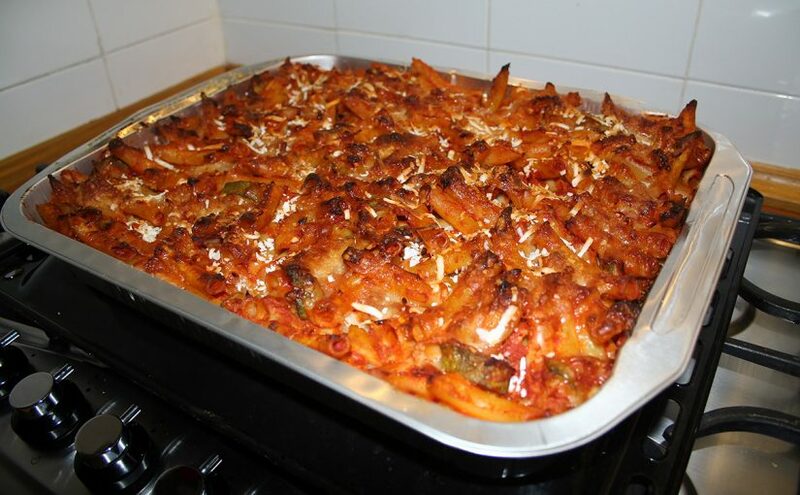 Therefore, a typical recipe is, combining such ingredients, “Pasta al forno”, a traditional Calabrian dish of baked pasta dressed in homemade sauce. The latter is made with ground meat and with fresh mozzarella, salami, hard-boiled eggs and ham. The dish is widely prepared as Sunday dish. Further, inside this recipe, it normal to meet, mixed or topped, the the very famous “peperoncino”. Whether fresh, dried, whole or crushed, rarely there is a meal made without some form of this spice. Famous throughout the country and varying in heat intensity, Calabria’s chili peppers are practically a must of this cuisine. A second recipe, using main local ingredients, is ‘Nduja, one of Calabria’s most famous and beloved foods! This soft, spreadable spicy sausage is a blend of local chili peppers, meat and salami. It is unique in Spilsby, a town in the province of Vibo Valentia, where it is made with the pork fat and lots of chili. A third recipe is “Lagane e cicciari”. This pasta dish is made with wide noodles, chickpeas, garlic and oil. We can mention also “Pasta ccu ri sarde”, a dish of Fresh sardines with breadcrumbs, raisins and pine nuts. Another one is “Pasta e patate ara tijeddra”, a dish from the town of Cosenza where ingredients – pasta, potatoes, tomato sauce, cheese and breadcrumbs – are taken raw and cooked together on the stove, then put briefly in the oven to obtain a crispy crust. “Maccheroni col ferretto” (also known as “Scilatelle”) is made from semolina durum wheat and water, using a special ‘ferretto’ a long piece of metal, to make a hole in the maccheroncini. They are served with very rich sauces, such as beef, pork or goat ragu, or with ‘nduja. “Licurdia” is a soup of different vegetables such as escarole, Swiss chard, asparagus or carrots. Another fundamental ingredient is the red onion of Tropea, the star of this dish, giving it flavor and sweetness. The vegetables are cooked with lard and water for a few minutes; once they have melted and turned into a cream, they are placed in a dish over slices of toasted bread, with red peppers and pecorino cheese to top it off. From vegetables, Calabrians obtain “Ciambotta”, a dish of eggplants, tomatoes, onion and herbs, a little bit varying from city to city. Among the more delicious Calabrian sweets, there is “Pignolata”, similar to “Struffoli” of Campany. It is a “mountain” of fried honey balls-shaped kind of sweet. Originally coming from a Sicilian recipe, Pignolata is very popular in the region, especially in the city of Reggio Calabria, during holidays like Carnevale and Christmas. “Ricotta Affumicata Crotonese” is a product of upper Crotonese and town of Mammola. The recipe provides that “ricotta” is the whey that remains from the processing of milk. Once formed the ricotta is smoked for a few days, exposing it to wood smoke, fragrant plants and chestnuts. Also “Giuncata” is a very special recipe, a cream of cheese produced in Sila and the Plain of Sybaris. The name comes from the practice of collecting the curd in cane containers, which give the cheese its unusual surface texture. It is a smooth texture, delicate, with a slightly acidic taste. 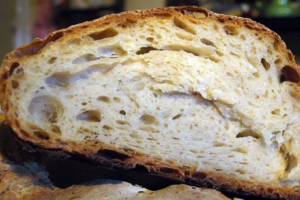 In the field of breads, we can cite “Pane di Cerchiara”, the most popular breads, coming from the town of Cerchiara, in the area of Pollino. It is cooked in furnaces and sold in every bakeries of Calabria. “Pane di Mangone” is also quite famous, it is cooked in Mangone, a small village in the province of Cosenza, and due to its special baking method, it stays soft for days. “Sguta”, instead, is a bread neriched of raw egg, cooked in the oven and eaten either sweet or savoury. “Pitta bread” is a traditional Calabrian flatbread with a crunchy crust and a soft inside, stuffed with peppers, tomatoes and herbs, or with sausage and peppers, or with broccoli and caciocavallo cheese…the options are many, and pitta sure is a favorite during feast days and also a classic Calabria street food. Finally, “Pane del Pescatore” is a bread enriched with eggs and dried fruits, reflecting the Greek and Arabic flatbread influences. Among the sweets, it is hard not to mention the traditional licorice of Rossano Calabro, known since 1700, or “Mostaccioli”, any sweets of Arabic origin made with honey and sweet wine. “Mostaccioli”, produced originally in Soriano Calabro, are now widespread throughout Calabria, similar to hard and dry cookies and sometimes enriched with warm must. We have to cite also “Torrone di Bagnara”, a sweet nougat, and “Gelato alla crema reggina”, a creamy pastry preparation usually consumed as gelato, typical of the province of Reggio Calabria and with a pinkish color.